British Columbia and California have several things in common, from old-growth forests and Pacific Ocean beaches to a love of electric cars and perceptions of a laid-back lifestyle. They’re also their respective country’s top jurisdictions when it comes to green leadership, according to Corporate Knights’ 2014 Green Provinces and States Report Card. This is the first year Corporate Knights has ranked both Canadian provinces and U.S. states, a move that reflects the magazine’s increasingly North American – indeed, global – voice. In doing so, the ranking methodology was streamlined to capture roughly comparable provincial- and state-level data from both countries. Whereas our 2012 provinces report card relied on 35 indicators across seven categories, we decided in 2014 to only use 10 key performance indicators (KPIs) across six categories – air and climate, water, nature, transportation, waste, energy and buildings. Many of the indicators used in the past were redundant or did not add much value to the analysis. In other words, more was not necessarily better. The 10 KPIs used in this year’s ranking hit the mark more accurately. Together, they reflect in a much simpler way provincial and state progress on reducing greenhouse gases, air pollution, water consumption, production of waste and impacts on nature. 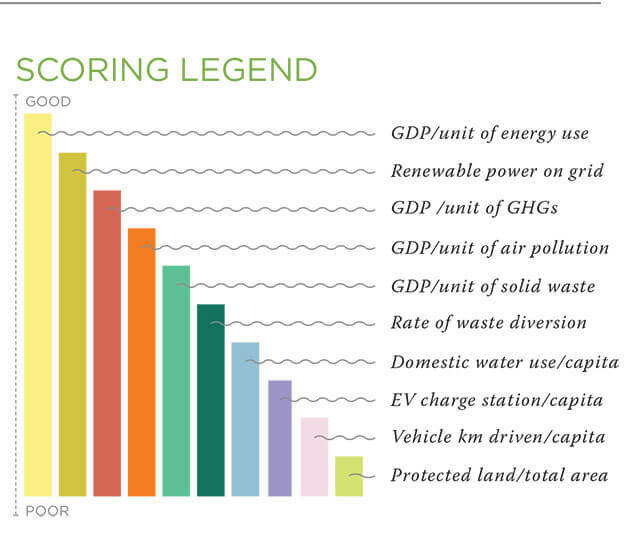 Other indicators were broken down and ranked by percentage – for example, the percentage of land and water protected in a jurisdiction or renewable electricity generated as a percentage of overall generation. Using this approach, B.C. and California emerged as clear leaders. Bridging them along the West Coast were Oregon and Washington, which both ranked among the Top 10 U.S. states for having a high mix of renewables on their grids, relatively low pollution levels and leading waste diversion rates. The northeast, however, also dominated. Quebec, Prince Edward Island and Ontario, which announced in April it had finished phasing out coal for electricity generation, scored much higher than their inland counterparts in Western Canada and the prairies, while New York, Maryland and New England states Massachusetts, New Hampshire, Vermont, Rhode Island and Connecticut made up the rest of the U.S. Top 10. The poorest performers? 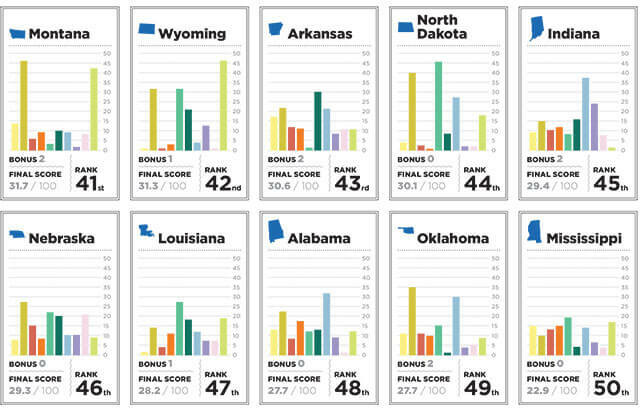 Deep South states, such as Alabama and Louisiana, distinguished themselves as among the heaviest drivers, poorest recyclers, least efficient energy users and greatest emitters of greenhouse gases. 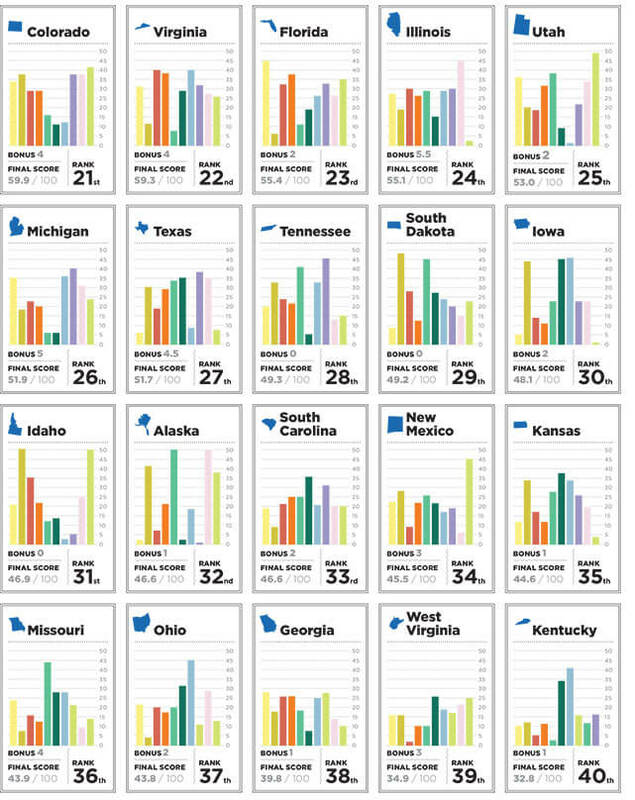 Of note among these was Mississippi, which ranked as the least green state in America. Similar observations were made for Tornado Alley states Nebraska and Oklahoma and their Midwestern neighbour North Dakota, all three of which ranked among the bottom 10. In Canada, the provinces Saskatchewan, New Brunswick and Alberta also landed at the bottom for their poor energy productivity, dependence on fossil fuels and resulting high GHG emissions. • Policies that drive sustainable forestry, measured by percentage of FSC-certified forests in a jurisdiction. 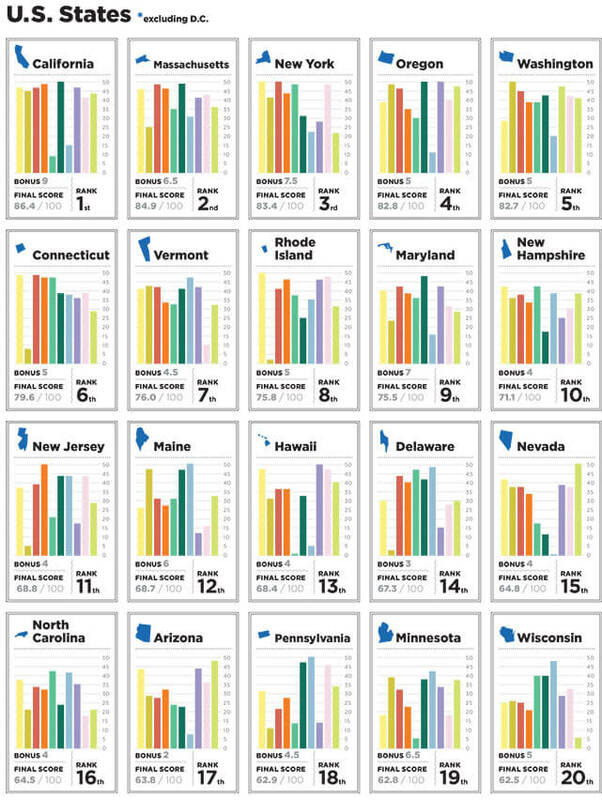 Bonus points were added to each jurisdiction’s ranking score to determine a final score. Fittingly, California received the most bonus points – a total of nine out of 10 – followed by New York with eight points and Minnesota, Massachusetts and Maryland with seven points each. 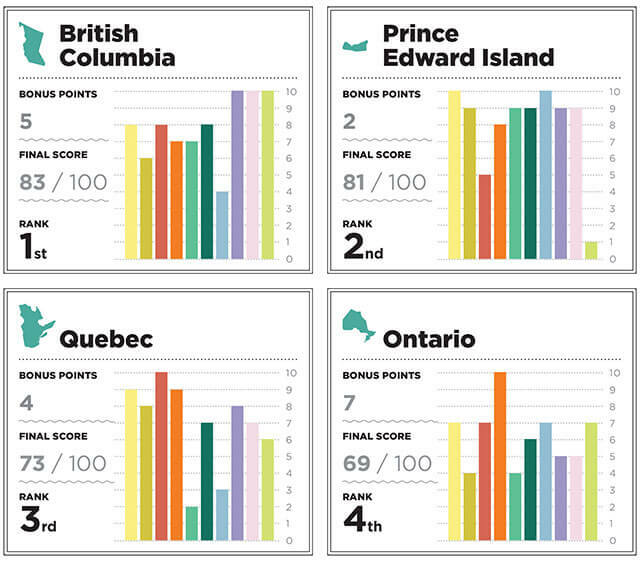 In Canada, fourth-ranking Ontario was tops with seven bonus points, followed by Nova Scotia, British Columbia and Alberta at five points each. Alabama, Idaho, Mississippi, Nebraska, Tennessee, North Dakota and South Dakota were the only U.S. states that received zero bonus points. 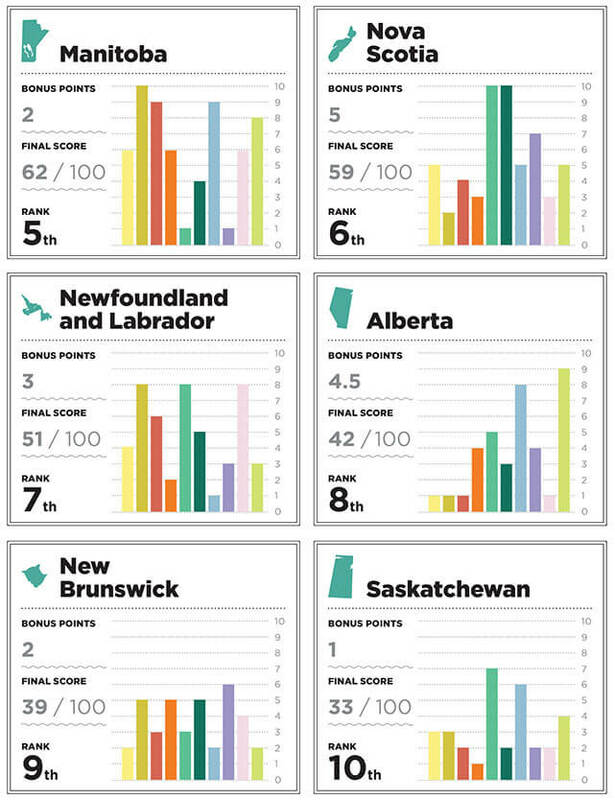 In Canada, no province received zero, but Saskatchewan was lowest with only one bonus point earned. Of all bonus categories, in only one category did all provinces and states get zero – i.e. for their lack of natural capital accounting.